Since 2000, China has emerged as Africa’s largest trading partner and a major source of investment finance as well. Large numbers of Chinese workers and entrepreneurs have moved to Africa in recent years, with estimates running as high as one million. China’s engagement with Africa has no doubt led to faster growth and poverty reduction on the continent. It is also relatively popular: In attitude surveys, 70 percent of African respondents have a positive view of China, higher than percentages in Asia, the Americas, or Europe. First, on the scale of China’s activities in Africa: The media often portrays China’s involvement as enormous, potentially overwhelming the continent. According to data from China’s Ministry of Commerce (MOFCOM), the stock of Chinese direct investment in Africa was $32 billion at the end of 2014. This represents less than 5 percent of the total stock of foreign investment on the continent. Stocks naturally change slowly. But the “World Investment Report 2015” similarly finds that China’s share of inward direct investment flows to Africa during 2013 and 2014 was only 4.4 percent of the total. Of course, direct investment is not the only form of foreign financing. The Export-Import Bank of China and China Development Bank have also made large loans in Africa, mostly to fund infrastructure projects. In recent years, China has provided about one-sixth of the external infrastructure financing for Africa. In short, Chinese financing is substantial enough to contribute meaningfully to African investment and growth, but the notion that China has provided an overwhelming amount of finance and is buying up the whole continent is inaccurate. The second main finding from the study concerns China’s direct investment and governance. China has drawn attention by making large resource-related investments in countries with poor governance indicators, such as the Democratic Republic of Congo, Angola, and Sudan. These deals are certainly part of the picture when it comes to China’s engagement with Africa. But the more general relationship between Chinese direct investment and recipients’ governance environments is different. After controlling for market size and natural resource wealth, total foreign direct investment is highly correlated with measures of property rights and rule of law, as one might expect. This is true both globally and within the African continent. China’s outward direct investment, on the other hand, is uncorrelated with measures of property rights and the rule of law after controlling for market size and natural resource wealth. In this sense, Chinese investment is indifferent to the governance environment in a particular country. While China has investments in the Democratic Republic of Congo, Angola, and Sudan, those are balanced by investments in African countries that have relatively good governance environments. South Africa, for instance, is the foremost recipient of Chinese investment. Furthermore, some of the big resource deals in poor governance environments are not working out well, so Chinese state enterprises may well rethink their approach in the future. A third main finding emerges from examining MOFCOM’s registry of Chinese firms investing in Africa. In the aggregate data on Chinese investment in different countries, the big state enterprise deals naturally play an outsized role. MOFCOM’s database on Chinese firms investing in Africa, on the other hand, provides a snapshot of what small- and medium-sized Chinese firms—most of which are private—are doing in Africa. Unlike the big state-owned enterprise investments, these firms are not focused on natural resource extraction. The largest area for investment is service sectors, with significant investment in manufacturing as well. Many African economies welcome this Chinese investment in manufacturing and services. The fourth finding relates to infrastructure finance. In recent years infrastructure financing has expanded and helped many African countries begin to rectify infrastructure deficiencies. Africa has been receiving about $30 billion per year in external finance for infrastructure, of which China provides one-sixth. 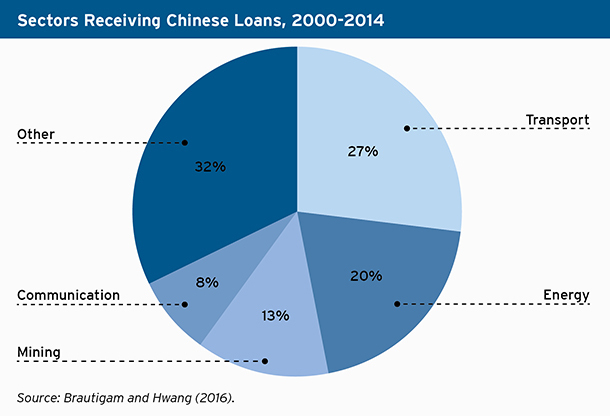 Chinese financing is a useful complement to other sources, particularly as traditional finance from multilateral development banks and bilateral donors is concentrated on water supply and sanitation. Likewise, private participation in infrastructure is primarily aimed at telecommunications. China has filled a niche by focusing on transportation and power. Chinese financing of infrastructure has also enabled Chinese construction companies to gain a firm foothold on the continent. Evidence suggests that Chinese companies have become highly competitive, crowding out African construction companies. This is an area where a trade-off seems to exist between, on the one hand, getting projects completed quickly and cheaply and, on the other, facilitating the long-term development of a local construction industry. This point leads to the fifth finding of the study. There are a lot of Chinese workers in Africa; the total is disproportionately high when compared to the amount of financing that China has provided and compared to migrants from other continents. This is a tentative conclusion because the data on this issue are particular weak. But estimates of Chinese migrants in Africa exceed one million. Many migrants initially move to Africa as workers on Chinese projects in infrastructure and mining and then, perceiving good economic opportunities, stay on. Similar to the dilemma confronting the continent’s construction industry, African countries face a tradeoff here: Chinese workers bring skills and entrepreneurship, but their large numbers limit African workers’ opportunities for jobs and training. The popular notion that Chinese companies only employ Chinese workers is not accurate, but the overall number of Chinese workers in Africa is large. Africa may want to take a page from China’s playbook and limit the ability of foreign investors to bring in workers, forcing them to train local labor instead. The popular notion that Chinese companies only employ Chinese workers is not accurate, but the overall number of Chinese workers in Africa is large. A final important finding of the study is that the foundation for the Africa-China economic relationship is shifting. China’s involvement in Africa stretches back decades, but the economic relationship accelerated after 2000, when China’s growth model became especially resource-intensive. It made sense for resource-poor China to import natural resources from Africa and to export manufactures in return. These patterns of trade and investment are now likely to gradually shift in response to changing demographics. The working-age population in China has peaked and will shrink over the coming decades. This has contributed to a tightening of the labor market and an increase in wages, which benefits Chinese people. Household income and consumption are also rising. Compared to past trends, China’s changing pattern of growth is less resource-intensive, so China’s needs for energy and minerals are relatively muted. At the same time, China is likely to be a steady supplier of foreign investment to other countries, and part of that will involve moving manufacturing value chains to lower-wage locations. Africa’s demographics are moving in the opposite direction. In fact, they resemble China’s at the beginning of its economic reform 35 years ago. About half of Africa’s population is below the age of 20, which means the working-age population will surge over the next 20 years, and will probably continue growing until the middle of the century or later. Roughly speaking, Africa needs to create about 20 million jobs per year to employ its expanding workforce. Twenty years from now, it will need to create 30 million jobs per year. Africa’s demographics present both an opportunity and a challenge. It is unrealistic to expect the China-Africa economic relationship to change overnight. Nor would it be reasonable to expect large volumes of Chinese manufacturing to move to the continent in the near future; it would be more natural for value chains to migrate from China to nearby locations such as Vietnam and Bangladesh. But if even small amounts of manufacturing shift, this could make a significant difference for African economies, which are starting out with an extremely low base of industrialization. And it is useful to have a long-term vision that an economic relationship that started out very much centered on natural resources should shift over time to a greater focus on human resources. For more on China’s engagement in Africa, check out the Brookings event hosted by the John L. Thornton China Center and the Africa Growth Initiative this Wednesday, July 13, at 3:30pm.